Interested? Well you might not have any choice. As part of the new Government "workfare" rules people claiming job seekers allowance can be forced to take unpaid work like this. Already Sainsburys and Waterstones have withdrawn from participation in the scheme following a storm of protests which you can read about on the Boycott Workfare site. The Guardian report today that so far 24 100 people have been forced under pain of loosing their benefits to take unpaid work. As far as I can tell Tesco are the only company that offer the added "benefit" of working a night shift. Following a flurry of protests on Twitter the job vacancy mysteriously disappeared from the Job Centrewebsite at 0010 this morning. One tweeter asked if the next step would be to bring back the workhouse. Others said they would boycott shopping at Tesco until they withdraw from the scheme in a similar way to Sainsburys. 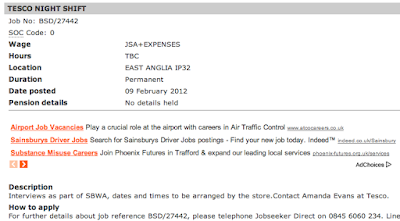 In case you were wondering, Job Seekers Allowance is the princely sum of £67.50 a week (or £53.45 if you happen to be under 25). 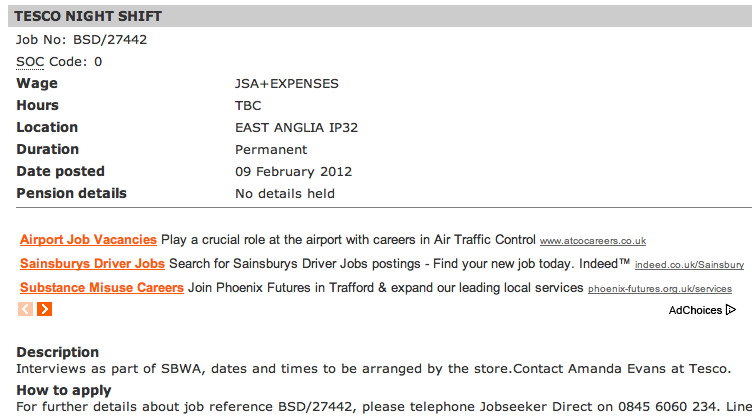 Apparently the going rate for this work would be around £7.50 per hour making a wage of £281.25 a week. I understand that there is an interview after six weeks but there is nothing stopping the store refusing to hire the person and just taking another set of free tax-payer funded workers. Shame on Tescos for taking part in this. They should pay their staff a fair wage for their work.